Floor preparation Grinding, Shot Blasting, Scabbling and cleaning using up to date machines with full dust control units to remove all floor irregularities, laitance, contaminants to provide an excellent key for surface topping, screeds, coatings & floor repairs using a wide range of cementitious and epoxy grouts and resins, to carry out all aspects of flooring remedials. 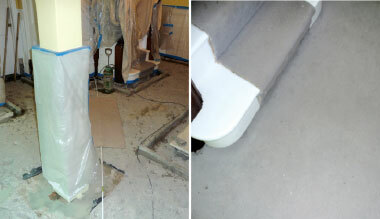 Main image: Floor preparation using Blastrac machines for Scabbling and Shot Blasting. 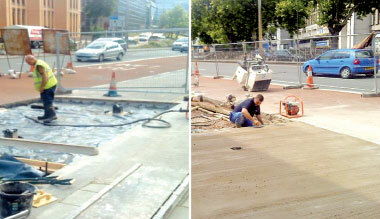 Concrete floor slab reinstatement a for bus lane. 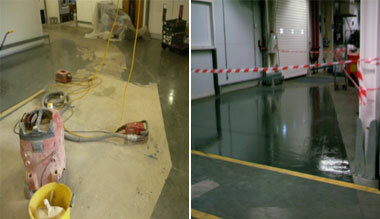 Floor remedials in a supermarket warehouse.